Before you get started…we all think the behavioral biases discussed below don’t apply to us. Also, we’re better at recognizing these biases in others than ourselves — bias blind spot. Also, All of these biases can be found outside of investing too — diet, exercise, shopping, and other habits. Most of our decision-making process is hardwired, having been built around survival over the past 100,000 years. It’s generally useful. Also, it tends to conflict with investing. Montier breaks decision making into two systems: the X-system is the default, quick, emotional responses or the mental shortcuts. The C-System is the slow, logical, deliberate, deductive responses. Most of us believe we run on the C-System. Most of us really rely heavily on the X-System. Because it still works often enough, we trust it more often than we should. Especially for investing. In a lake, there is a patch of lily pads. Every day the patch doubles in size. If it takes 48 days for the patch to cover the entire lake, how long will it take to cover half the lake? In the original study behind the test, only 17% got all three questions right and 33% got none right. In a group of professional investors, 40% got all three right and 10% got none right. And if you got all three questions right and think you’re impervious to biases, you’re not — overoptimism, overconfidence, and confirmation bias are not immune from the test. What does the test prove? We’re good at leaping to the first conclusion rather thinking things through. It works great if we’re trying to survive being mauled by an animal, but works terribly if we’re trying to survive in the stock market. Empathy Gaps — The “inability to predict our own future behavior under emotional strain.” In other words, we have a hard time predicting how we’ll act during some future stressful event. We overestimate our intellectual abilities and underestimate our emotional drive. Example #1: How we think we’ll act during the next market crash versus how we really act during the next market crash. It’s easy to think we’ll buy stocks during the next crash, especially when we think it while markets are calm. Example #2: Our inability to factor procrastination into a project. The solution is to impose deadlines. Investors can prevent empathy gaps by planning ahead. Montier offers up the seven P’s: Perfect Planning and Preparation Prevent Piss Poor Performance. If you want to be able to buy the market when everyone is feverishly selling and not fall prey to similar emotional decisions, then have a plan of attack set up in advance that forces the action. Sir John Templeton used to set a wishlist of great companies he wanted to buy if they were only cheaper. He’d place standing buy orders at reduced prices to force purchases when emotions are normally running high. Over-Optimism Bias — we tend to be optimistic by nature. we have a positive bias, believing good results will happen more often than bad results. The Illusion of Control — we think we can influence the outcome and often mistake randomness for control. Also, the illusion of control enhances our optimistic tendencies. Self-Serving Bias — we tend to act in our best interests. Overconfidence Bias — we tend to be more confident in our own abilities. We believe we’re above average (drivers, lovers, workers, investors, predictors of the future) even though we can’t all be above average. Also, we often confuse confidence in ourselves and others for skill. We prefer people who sound confident even when they’re wrong. And worse, we tend to believe the more confident experts, and do so without any level of skepticism. Over-optimism and overconfidence in investing leads to more trading, higher turnover, and underperformance. Also, men are worse than women. Simply, it leads to a belief that we’re not only smarter than everyone else but we can get in and out of the market faster than everyone else. Of course, we can’t all be smarter than everyone else. What we can be is more disciplined than the overconfident, over-optimist investors. Guessing the future is hard. Overconfidence doesn’t help. All the evidence points to it being practically impossible without luck. But if you want to try, you have to get the forecast right, then you have correctly guess how the market will react, and finally, you have to guess which investment vehicle will profit the most … even still, the only way you’ll beat the market is if it’s different from the consensus view. Forecasts are demand driven by investors who somehow believe it’s useful (like in confirming their beliefs or offering an illusion of certainty or as an anchor to base decisions around). The Illusion of Knowledge — confusing a surface understanding of something with a deep knowledge of it. Signal vs Noise — not a bias, but is made worse by biases. Being incapable of separating what’s useful (signal) from the useless (noise) leads to mistakes. And we tend to overweight some info, underweight other info, and completely ignore others. So more information doesn’t necessarily produce better results. Studies show more information does not make us more accurate, just overconfident on our accuracy. Checklists can help filter the noise from the few pieces of information or factors that really matter. Day to day market fluctuations is mostly random. That doesn’t stop everyone from trying to give meaning to the movements. The fictional stories might offer some certainty for the randomness of markets but its all nonsense. It’s better to just tune out the noise. Confirmation Bias — we are more likely to look for information that agrees with our conclusions, beliefs, and decisions than disagrees. Sometimes we discount disconfirming evidence as “wrong,” sometimes we’re willfully blind to it, and sometimes we twist it to support our conclusions. Falsification — the process of trying to prove something wrong. Conservatism Bias — we’re slow to change our minds when new information arrives. Sunk Cost Fallacy — the tendency to allow past costs (like time, money, emotion, or effort) to affect current decisions. Anchoring, confirmation bias, overconfidence, and the sunk cost fallacy are reasons why we’re slow to change our minds. Narrative Fallacy — giving meaning to a sequence of random events or facts by weaving a story that forces a link of cause and effect rather than judging each individual event or fact on its own merits. Stories are in constant supply in the stock market. Every stock covered in the media is given a story. IPOs literally go on a roadshow to spread their story. Then there are story stocks, which trade not on fundamentals, but hope and promise of future potential. All these stories affect our views. Almost all have an emotional pull to it. The solution: Always stick to the facts. Predictable Surprises — like bubbles, predictable surprises may be seen but the timing of them is always uncertain. Example: Several people recognized the housing bubble in advance but no one knew when it would burst. Myopia — extreme focus on the short term. Inattentional Blindness — being blind to the obvious because we’re focused on something else. Over-optimism, the illusion of control, self-serving bias, myopia, and inattentional blindness help prevent us from seeing bubbles. The solution: know that bubbles won’t last forever. All eventually burst. Displacement — the start created by some opportunity or innovation in a sector of the market. New investment in the area germinates confidence slowly. Credit Creation — new credit (new money i.e. new share issuance) feeds the flames, feeds growth, confidence, and higher prices. Euphoria — Prices can only go up is the story. New valuation metrics are created to replace the old and justify higher prices. Over-optimism and overconfidence abound. Speculation runs rampant. “This time is different!” is the word on the street. Financial Distress (Critical Stage) — The weight of excessive leverage shows signs of cracking, fraud is found, insiders sell, prices fall, and margin loans are called. Revulsion — Panic ensues, investors would rather sell at any price than own it. The worst cases are scarred for life. (Long term) Individual investors have an advantage over professionals when it comes to investing in bubbles (and in general). They’re not beholden to a benchmark or strategy or career risk or redemptions. And they don’t have to broadcast their holdings to anyone. They only have to manage their behavior. Of course, bubbles continue to repeat because we fail to learn from past mistakes. The reason we fail to learn from our mistakes is that…we don’t see them as mistakes. Self-Attribution Bias — we see success due to skill and failure due to bad luck, out of our control, or blame it on someone (something) else. Hindsight Bias — the knew-it-all-along-effect. After knowing the outcome, we believe it was more easily predictable than it was at the time. The solution: keeping a record of the reasons behind investment decisions and track the outcomes — skill (right for the right reasons), good luck (right for the wrong reasons), bad luck (wrong for the right reasons), mistakes (wrong for the wrong reasons). It holds us accountable for our original views before the outcome. Action Bias — the need to do something instead of nothing. A study of soccer goalies was taken around penalty kicks. 94% of the time, the goalie’s dove left or right to block the kick. Had they stood in the center — done nothing — they would have blocked 60% of the kicks. They dove because they wanted to be seen making an effort and would have felt worse had they done nothing and missed. Myopia is not limited to bubbles. We love quick results. It’s why get-rich-quick schemes never go out of style. Also, we have a bias toward action and the urge to act is higher after a loss. The solution: PATIENCE! Discipline helps too. Also, trust in the process. Social Pain — studies show we find it uncomfortable to go against the crowd even if the view is wrong. When we do, it can trigger emotional fear. The Illusion of Invulnerability — blind to overoptimism and extreme risks. Collective Rationalization — blind to confirmation bias and conservatism — discount all disconfirming evidence and fail to change their minds. Belief in Inherent Morality — see their view as correct, so its morally and ethically right. Stereotyped Views of Out-Groups — give negative stereotypes of all non-conforming groups. Direct Pressure of Dissenters — vocal doubters are silenced. Self-Censorship — other doubters keep quiet themselves out of fear of retribution. The Illusion of Unanimity — views are seen as unanimous. Mind Guards — confirmation bias is used as a filter to protect the group from disconfirming evidence. Introspection Bias — we believe we know ourselves better than we actually do. Fundamental Attribution Error — we tend to blame other people’s actions on their behavior while blaming our own actions on external factors. We all want to think we’re contrarian, independent thinkers, or the exception to the rule. Being truly contrarian is difficult, not only because of conformity but because you’re guaranteed to initially look wrong while everyone else looks right (assuming you’re eventually proved right). The solution: courage, critical thinking, and perseverance. Ben Graham: “If you believe that the value approach is inherently sound then devote yourself to that principle. Stick to it, and don ’t be led astray by Wall Street’s fashions, illusions and its constant chase after the fast dollar. Let me emphasize that it does not take a genius to be a successful value analyst, what it needs is, first, reasonably good intelligence; second, sound principles of operation; and third, and most important, firmness of character. 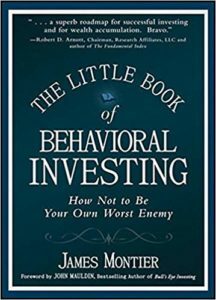 Loss Aversion — we hate losses about twice as much as we enjoy gains. Or losses loom larger than gains. A short-term focus makes loss aversion worse, since the randomness of markets in the short term can deliver brief paper losses at anytime. Also, constantly checking your portfolio means you’re more likely to notice said paper losses. So stop constantly checking your portfolio! Disposition Effect — the tendency to sell winning investments and hold on to losing investments. Terry Odean studied investor brokerage accounts. He found that investors held losing stocks longer than winning stocks, are almost twice as likely to sell winners than hold losers, and that the sold winners outperformed the held losers. Any number of biases – overoptimism, overconfidence, sunk cost, self-attribution — can be behind it. Simply, we hold on in the hopes of a recovery. Also, professional investors aren’t much better. Andrea Frazzini found that the average pros are 1.2 times as likely to sell winners than hold losers. The worst performing pros were no better than individual investors. Endowment Effect — we put a higher value on things after we own it than before. Status Quo Bias — we prefer things stay the same and show it by doing nothing. Believing something is worth more than the current asking price and a bias towards inactions result in a natural reluctance to sell. Knowing when to sell is one of the hardest, yet most important parts of investing. Casinos have a natural advantage thanks to their process. They survive by offering games of chance that are ever so slightly tilted in their favor. They’ve built their business on a process that will win out over thousands of spins of the roulette wheel, rolls of the dice, or pulls of the slot machine. Time is a key ingredient to their process. In the short term, the casino will lose on some of those spins, rolls, or pulls. They fully expect that a few patrons will beat the odds and come out ahead. A casino’s process is built on looking “wrong” in the short term while being “right” in the long run. Doing so guarantees a good outcome in the long run. So focus on the things you can control. No investment process is perfect. It will not produce good results every single time. A good process, that exploits edges, delivers bad breaks sometimes but will win out if given enough time. Good behavior is key with time. Outcome Bias — we tend to judge past decisions based on the quality of the outcome rather than the quality of the decision. Every decision has four possible results: good decision/good outcome (deserved success), good decision/bad outcome (bad break), bad decision/good outcome (dumb luck), bad decision/bad outcome (poetic justice). A hyper-focus on outcomes leads to general stupidity — show higher loss aversion, embracing certainty, embrace noise, and follow the herd. Knowledge is not enough to improve behavior. Simply, knowing every behavioral bias does not equate to better behavior. Changed behavior requires changes in habits. Setting simple rules help too. Changing habits work much like compounding, small gradual improvements over time pay off in big ways. A focus on process is what produces gradual improvement.